The California Center for Natural History assisted San Mateo Parks, Sequoia Audubon, Yerba Bioadvocacy, California Lichen Society, and the California Native Plant Society in an intensive Bioblitz of the wonderfully diverse Huddart Park that sits in the hills just above Redwood City. The morning started off with an introduction to Bioblitzes and the use of iNaturalist by Jennifer Rycenga of Sequoia Audubon. Participants broke into teams to cover different parts of the park and within just a few hours over 850 organisms were observed with any amazing diversity. Everyone got together for a wrap up party at Portola Valley Community Hall with food and time for people to help identify the organisms that were seen in the morning. 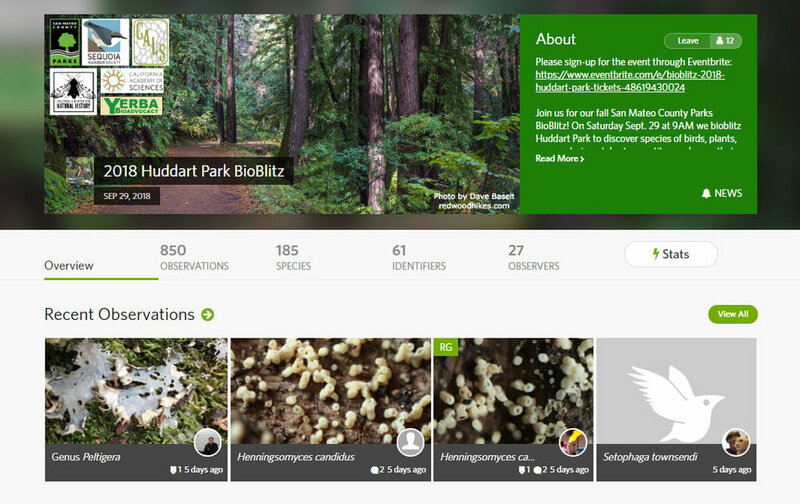 See all of the observations at the iNaturalist Project page for the Huddart Park Bioblitz.